Snorkel Mask For Beards – Start Snorkeling With A Beard! Cozumel is one of the top rated snorkeling destinations in the world. It is full of coral reefs, unique marine lifestyle, and more importantly a memorable in and off the water experience. But do you know what it takes to have the best snorkeling in Cozumel? 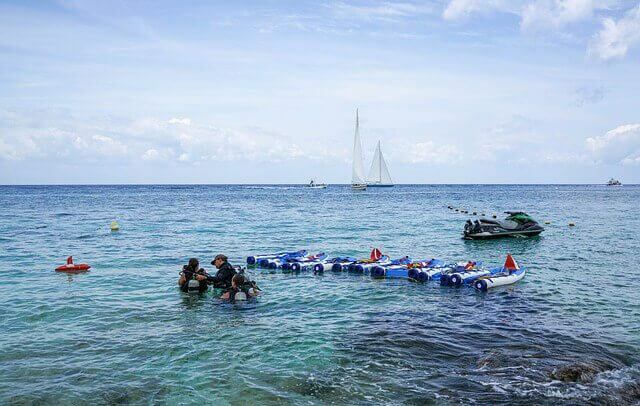 In this post, I want to share with you a few tips that will actually guarantee a memorable snorkeling experience in Cozumel. These tips have helped me here before and I guess they will also leave you with a memorable snorkeling experience in Cozumel. Cozumel has variable weather conditions. Due to this, it is important that you learn how to swim freestyle even without a jacket on. Just make sure you keep the snorkeling vest on all the time and capitalize on these swimming tips too. Relaxation is a swimming skill that will definitely help you to feel comfortable under water. It is important if you don’t want to scare the marine lifestyle that you are watching away. It also allows you to stay long under water. Here is what to do to relax under water. Snorkeling is a two-way traffic experience. You have to keep an eye on the gears while swimming too. More importantly, you should prevent your snorkel from filling up with water and choking you. This can be done by exhaling powerfully so you can clear the path of the snorkel. In addition to that, you should also keep your mask clean by simply raising your face over the surface and then pulling the mask slightly from the bottom part. NOTE: These two snorkeling swimming tips are all you need to make the difference and get a touch of the awesome mystic snorkel Cozumel. They are vital and could potentially be the difference between the best snorkeling in the Caribbean and the worst. Cozumel has some of the most colorful reefs that you can get today. In fact, exploring Cozumel will reveal what a stunning place the island is. That’s why we take a dive and give you the best corals reefs to go with. Paradise Reef is about 45 feet deep and is divided into the three-part reef. It is the best place for anyone with a little or zero experience when it comes to scuba diving. More importantly, it is full of all kinds of underwater creatures including lobsters, crabs, yellowtails, octopus, toadfish, angelfish, and moray eels among others. Santa Rosa Reef is the best snorkeling place in Cozumel. The spot is well known around the world and comes at the top of the scuba divers bucket list. It is a world-class tourist destination and seldom will you find it quite. Nonetheless, the reef is quite accessible through San Miguel so the trip is often easy. Santa Rosa Reef is one of the deepest reefs in Cozumel and because of this has quite a chunk of vast sea life and creatures to watch. The corals are famous for unique fish such as scrawled filefish, parrotfish, rare sea turtles, and French angelfish. Even without a Cozumel snorkeling map finding Santa Rosa Reef is easy as it is marked with abundant giant sponges and irresistible stony corals. This is literally one of the best snorkeling spots. It is found at the Southwest Cozumel. Lately, it is the scuba divers favorite spot. Palancar Reef is surrounded with a number of beach clubs such as palancar beach club where you can find the best gears too. The reefs are beautiful and stunning to behold. Thanks to the incredible biodiversity that allows you to find numerous creatures. Some of the best marine creatures that you will find at the Palancar Reef include sea turtles that are common to Palancar snorkeling, eagle rays, and much other colorful fish. Las Palmas Reef sits right next to Paradise Reef. It is the one reef that’s known to have so many brain corals and also sponges. At this reef, you will easily enjoy the sight of seahorses, Sargent fish, batfish, honeycombed cowfish, and the splendid toads among many other creatures. Most people frequent it at night. Thanks to its awesomely shallow depths and the most wonderful night view. If you are looking for the best snorkeling off the beach in Cozumel, you might want to try this one. For the most memorable snorkeling in Jamaica, there are a few other tips that you can always focus on including. NOTE: For beginners, these tips will be very important. However, it is important to talk to the people you are snorkeling with so you can always get the assistance that you need. More importantly, understand and accept your limits so that you can have the best snorkeling experience too. From the most memorable free snorkeling in Cozumel to enjoying the best sceneries, you can always count on this one of a kind location to leave you with an experience to remember. Even better, it is a great place to bring your entire family out and enjoy some of the best outdoor experiences. So, if you love snorkeling, I would suggest putting up your next destination to be the Cozumel and finally get down to enjoying personalized snorkeling with numerous marine lifestyles to watch. Hi This is Norma A Robertson. I am doing a part time job as UI designer. My Recent Passion is snorkeling . And I have been blogging about snorkeling since 2015. When i am in florida you can usually find on the water either kayaking or snorkeling. Love to share experience with other people and reviewing some high quality products for outdoor lovers. Hope you will enjoy . The owner of this website is a participant in the Amazon Services LLC Associates Program, an affiliate advertising program designed to provide a means for sites to earn advertising fees by advertising and linking watersurfpro.com to Amazon properties including, but not limited to, amazon.com, endless.com, myhabit.com, smallparts.com, or amazonwireless.com. Certain content that appears on this site comes from Amazon Services LLC. This content is provided ‘as is’ and is subject to change or removal at any time. ‘Amazon’ and the Amazon logo are trademarks of Amazon.com, Inc. or its affiliates. Copyright © 2019 by Water Surf Pro.